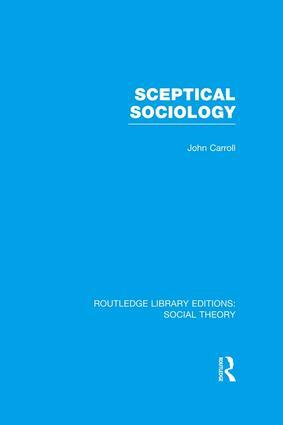 John Carroll contends that since 1918 sociology has distinguished itself by making society appear as dull as it is at its worst. Using barbaric jargon, legalistic syntax and vacuous statistical tables, and driven by an obsession with the humdrum, it has exhibited some of the worst traits of the culture it should have been laying bare. Sceptical Sociology examines where sociology went wrong, and what ought to be done to transform it into a worthwhile enterprise. In a series of studies of contemporary Western society, the author puts into practice the principles of a ‘sceptical sociology’. There are enquiries into the cleanliness compulsion among housewives, the conflicting dream and reality of the tourist, the moral centrality of the car, the tactics of the latest shopping palaces. There is an allegory on fur hats, a dark portrait of a typical modern marriage, a putting of intellectuals in their place, and a pursuit of the sociology of space through the universal longing for home. The author contends that sociology ought to be the important stories about a society and its times, well told. Sceptical Sociology attempts to show that it can be well done.